Kerala is located between north latitudes 8 degree 18' and 12 degree 48' and east longitudes 74 degree 52' and 72 degree 22', this land of eternal beauty encompasses 1.18 per cent of the India. The land area of kerala is about 38,863 sqkm, with a total population of 31,838,619. It is about 3 per cent of the country's population. The population density of the state is about 655 people per square kilometer, About 16 per cent of the people live in the cities. Most of the others live in large, semi-urban villages. If there is one place in the riveting diversity of India where there is tangible beauty and a phenomenal thing like total literacy, it is in Kerala. Kerala is full of good things. This small State in the southern tip of the Indian peninsula is an easy winner owning to its great mind-blowing landscape and infinity of intriguing customs, high-intensity cultural life and educated public so often dressed in white. From Kasargode to Thiruvananthapuram Kerala is choc-a-bloc with places that attract tourists and travelers from all over the world. South India has hot, humid climate and all its states are coastal. Rainfall is abundant and so is the supply of fresh fruit, vegetables and rice. Andhra Pradesh produces fiery Andhra cuisine which is largely vegetarian yet has a huge range of seafood in the its coastal areas. Tamilnadu has Chettinad cuisine, perhaps the most fiery of all Indian food. This style too is largely vegetarian. From Kerala comes Malabari cooking, with its repertoire of tasty seafood dishes. Hyderabad is home of the Nizams (rulers of Hyderabad) and regal Nizami food rich and flavorful with tastes ranging from spicy to sour to sweet. Hyderabadi food is full of nuts, dried fruits and exotic, expensive spices like Saffron. 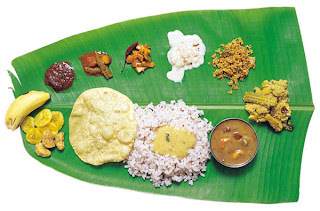 Food in Kerala (Malayali food please, not Keralan) depends both on area - South versus North Kerala, backwaters versus the hills - and community: Moplah (Muslim), Syriani (Christian) and different Hindu communities. Many things are common like the use of coconuts, fish and rice, but other things can be quite different - obviously something like beef which is a big feature of Syriani food would not be eaten by Hindus - but I also find less known differences. For example, the Thiyya community from North Kerala , is totally obsessive about shellfish like kalamakai (mussels). No one from South Kerala ever seems to eat them which is perhaps for geographical reasons - rocky coasts versus sandy beaches. One of the interesting points of difference between communities is their differing use of breads all based generally on rice flour: appams and iddiappams for Syrianis, pathiri for Moplahs, nai-patthal for Thiyyas, appams and puttu for Nairs, dosas and puttu for Namboodiris. These are well worth trying since most of them would be hard to get outside Kerala. Another Kerala staple is tapioca which can be very good cooked there (and only there). In Cochin and the backwaters the cult fish to try is karimeen or pearl spot, a quite beautiful really estuarine fish. Otherwise you'll get the usual seer, a big meaty fish which tends to dominate fish cooking in South India. Even in Bombay, where pomfret rules, followed by rawas and surmai, you'll get more variety than you get in restaurants in South India. But I mustn't get into a rant on this. Moplah cooking is among the best in Kerala, and relatively easy to get since many Moplahs have started restaurants. Their biriani is famous, if you like biriani (I don't). They have interesting Arab influenced dishes like harisa, which is their version of the stewed wheat and meat concept that becomes haleem in Hyderabad and khichada in North India. They have lots of lesser known things like mutta-malas, egg yolks cooked in sugar syrup and pulled into strings. Syriani spiced beef (erachi olathiyathu) is wonderful. The authentic version will be dry fried and spicy, but not explosive and usually cooked with hard chips of coconut. Totally addictive stuff. Meen vevichadu is their fried fish, which varies a lot. Hindus usually eat fish as well, and its always pretty good, whatever the version. Two vegetarian dishes that I totally gorge on are kalan, made from green bananas cooked with yoghurt and coconut oil and olan, made from pumpkin and beans cooked in coconut oil (if you don't like coconut oil, and some people hate it with a passion, you're going to have a hard time in Kerala). The essential ingredient of the daily diet is rice. Breakfast, lunch or dinner, it is some rice preparation or the other, served along with a variety of fish. Fish is consumed in a variety of ways – it is preserved after being dried and salted or cooked in a delicious coconut gravy. Prawns, shrimps and crustaceans constitute some of the other famous delicacies. After the morning dose of coffee, a typical malayali household serves breakfast that may either consist of soft idlis, prepared out of a paste of fermented rice and black pulses, or dosa, an oval spread of the same ingredients. Well-seasoned appams or periappams, made by mixing this paste with tomatoes, onions and other handy vegetables, are some of the other morning culinary delights. Midday meals consist of boiled rice that may be mixed with moru (curd or bitter milk) or rasam (thin clear pepper water or soup) and a range of vegetables. Pachadi is a delicious dish, cooked out of tiny pieces of mango, mixed with hot spices. Sambar, pulses prepared with vegetables is a standard daily fare. Thoran, a coconut-based dry fish dish that is mixed with minutely chopped vegetables, herbs and curry leaves, and similar to avial, which is cooked in a sauce, is another delectable dish.Pappaddakams, or crunchy round flakes made of rice flour,chutneys (a kind of sauce) and pickles, are scrumptious additions without which a meal is incomplete. Wheat preparations are more popular in Muslim establishments. Well-prepared spirals called barottas and pathiris are made from refined flour, fried in oil and served with vegetables and curries.Chappathi, poori (a sort of baked or deep fried equivalent of bread)may be cooked optionally. A melange of aromas resulting from the free use of pepper, cardamom, cloves, turmeric, ginger, chillies, and mustard, used in most curries, fill the kitchens of the well-to-do, but generally the poorer folks content themselves with kanji (rice with water) and take fish with tapioca. Most dishes in Kerala are cooked in coconut oil and are incomplete without a mandatory use of coconut in some form or the other. Kerala is equally famous for traditionally homemade snacks a variety of banana chips, and rice flour cookies, are served with evening coffee.